The Treat-A-Tree (T-A-T) injection system with bucket, plumbing and injectors to allow pesticides to be taken up by the affected tree. GEORGE NEWS - Trees are dying all over George due to Polyphagous Shot Hole Borer infestation. This beetle with its symbiotic fungus poses a huge threat to tree life in the George area and further abroad. Preventing the spreading of the infestation is vital and to this end, Adri Joubert of Glenwood Lodge took initiative to convene a series of workshops for concerned residents with specialists in the field. The infected trees include, but are not limited to, oaks, liquidambars, maples, macadamia and swamp cypress. Trees should be inspected for small holes (the borer is less than 2mm long) and darker affected spots where resin or sap is oozing out or a small round ball of powder has formed at the entry of the hole. Some successes were achieved with contact pesticides, but it is believed that more focus on systemic chemicals is needed to home in on the borer specifically, rather than wide-spectrum contact insecticides and fungicides. It is expected that some systemic insecticides may protect a tree for up to one year. 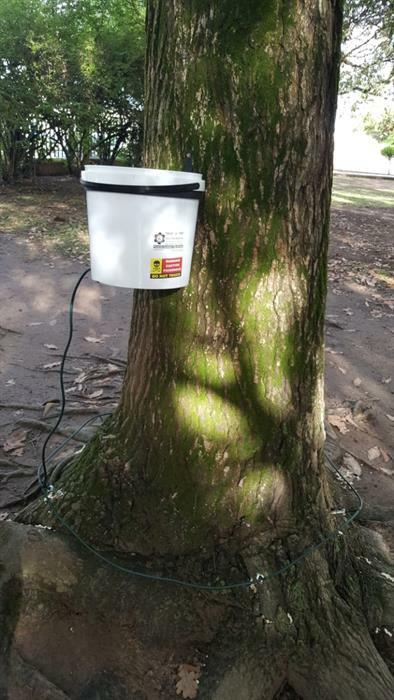 A very cost-effective solution was suggested by a local resident who developed an injection system that uses the natural water conduction through the trees to carry insecticides and fungicides up the tree. The injection system works very well and customers can either have the treatment done or buy a treatment kit to treat their own trees. A lot of research is still required on pesticides for the borer and its symbiotic fungi, as well as the dosages that should be used. To treat a tree is much cheaper than to have a dead tree removed. Once a tree is treated, the dead branches need to be professionally removed since the treatment does not kill the beetles in dead branches. Branches can be solarised (covered in thick plastic to reach a high temperature) or certain chemicals (available from Agri) can be sprayed on site. This needs to be left for a period until the beetles are dead before branches are removed from the site. It is important to prevent the infestation from spreading through moving infected wood to uninfected areas or burning infected dead wood, since these beetles then fly out and spread even faster. Please join the workshop this evening, 14 March, at 18:00 at Glenwood Lodge. RSVP to admin@glenwoodlodge.co.za.